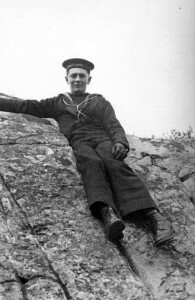 Wilfrid Jury’s adventures as a young man began in 1914, when he joined the navy. He first served as a recruiting officer in London, Ontario, then became a billeting officer in Montreal and Quebec City. Next he became special messenger to Commander Wyatt at Admiralty House in Halifax. On December 6th, 1917 tragedy struck Halifax Bay when the Belgian Steamer IMO and French Steamship MONT BLANC collided, which resulted in a massive explosion and over 1000 deaths. Within the chaos and confusion of the blast, the Navy sent word to Amos and Julia that their beloved son was missing and presumed dead. Fortunately, Wilf who was severely injured, washed ashore and was taken in by a kind Darthmouth family who had nursed him back to health. In January of 1918, after being hospitalized for his injuries, Wilf returned to limited duties as an able seaman on the NIOBE, but, less than 6 months later, he contracted tuberculosis and was discharged from the Navy for Medical reasons. He was awarded the War Service Medal and the British War Medal for his service. Almost immediately after his discharge, Wilf returned home and entered Queen Alexandra Sanatorium in Byron. While spending almost 7 years in and out of “The San” for treatment of tuberculosis, Wilf was tutored by Dr. Andrus who shared a similar interest in Canadian History. Wilf immersed himself in his work and moved to Oregon, upon recommendation of the doctor, in order to heal his severely damaged lungs from the explosion, to study the life ways of the Native Americans, and to experience living as they did long ago. Wilf soon returned to Ontario to continue his research and enormous interest in artifacts, collecting, and excavating. In the early 1930’s there was discussion between the Jurys and the University of Western Ontario President W. Sherwood Fox and Librarian/ Historian Fred Landon about the possibility of a museum. In 1932-33 a plan was agreed upon for Amos and Wilf Jury to donate their collections to the university. Amos and Wilf were appointed honorary curators of the then Museum of Indian Archaeology.